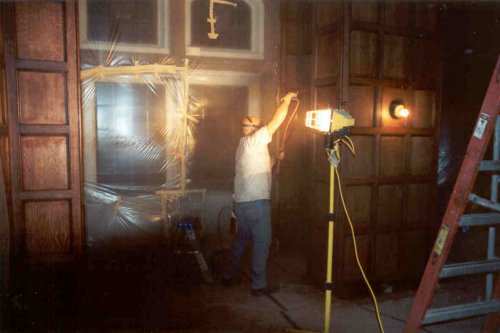 We have experienced major renovations of some of the key areas of the Castle, including the Great Hall, Ballroom, ceilings, floors, the loggia, the fountain, the garden pond, the gate, and more. Below are slideshows of a few of our renovations. 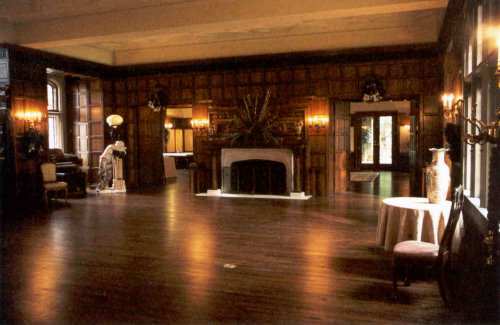 Here is the "Great Hall" before we started. It had been split into several rooms for an apartment. This was the living room part. 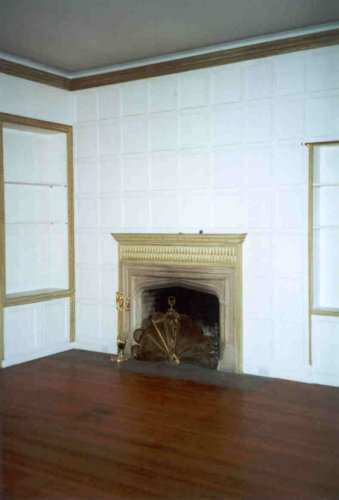 This is the same original room with the furniture removed. 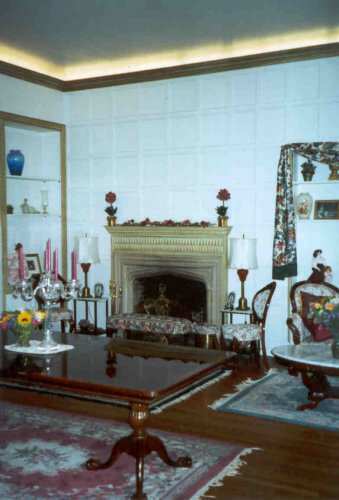 Note the size of the fireplace. This is the same room, from about the same point of view, with the walls and false ceiling taken out and the floor covered. 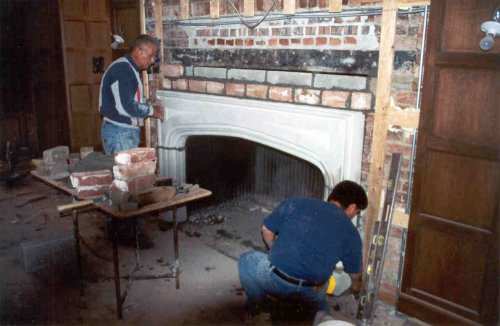 Note how the original fireplace had been bricked in and made much smaller. 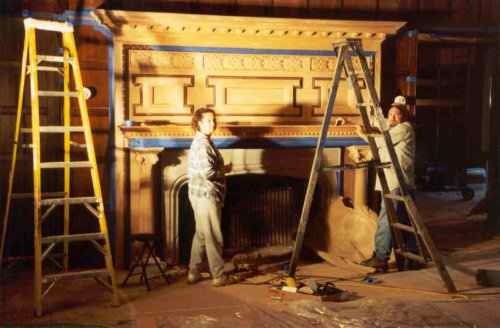 Now the fireplace has been opened back to its huge original size, the hardwood floor replaced and batten strips added to the walls, ready for the new paneling. 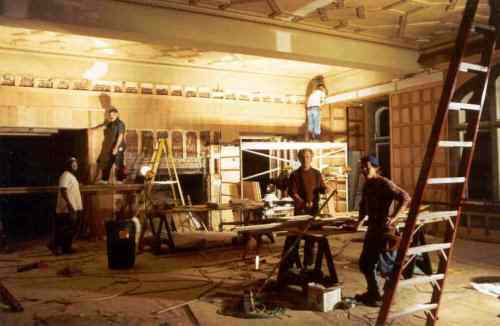 Construction continued almost around the clock, in order to meet the movie deadline. 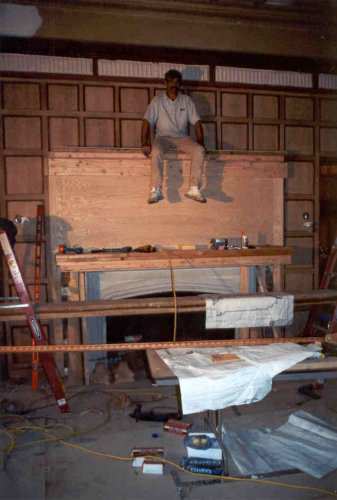 The giant fireplace mantel was reconstructed in place. A new limestone hearth was cut and installed to match the original. 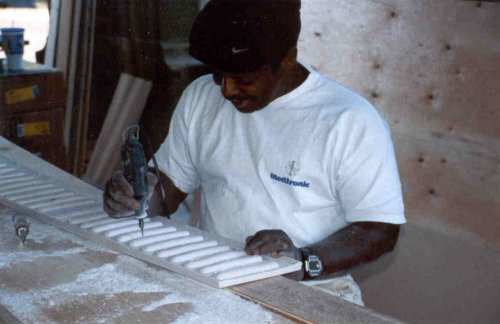 All 7,000 new dowel holes were filled, puttied and sanded. Finishing touches are made on the new reconstructed cove moldings. Several coats of stain and finish were applied, some by hand. The new mantel being stained. 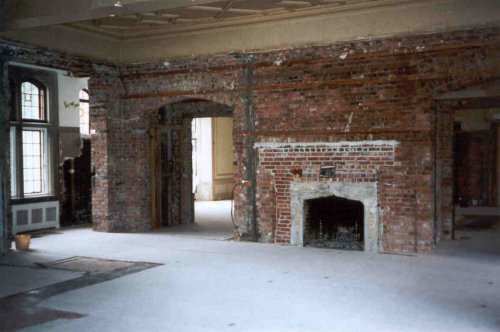 Here is the restored Great Hall, before furniture is added. Our furniture is now starting to be added. 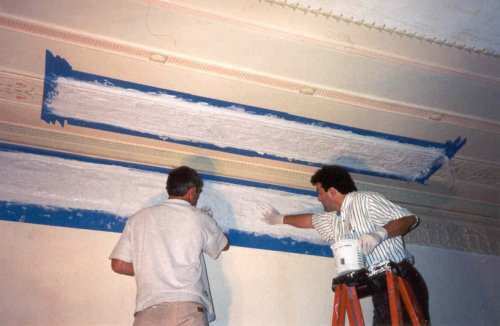 Some of the original ceiling moldings had been damaged over the last 90 years and needed to be restored. The first step was to mask off an original good area to be duplicated. 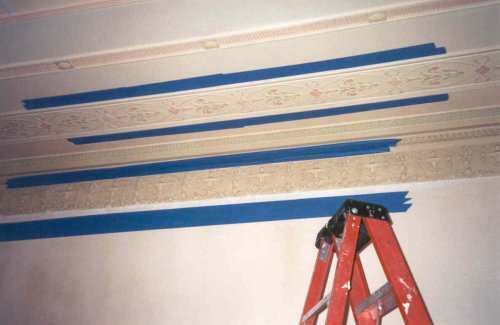 A special rubber compound is mixed up and quickly painted over the molding. Cheese cloth is then laid into the rubber for additional strength. 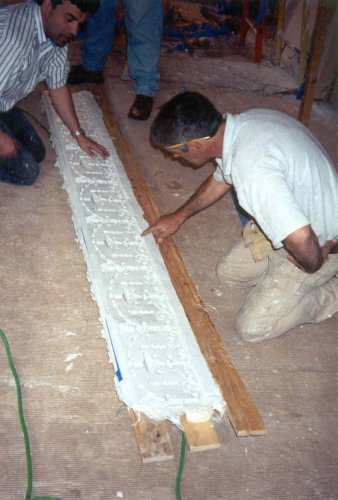 Multiple layers of the rubber compound are added by hand. A support and frame is built to hold the mold, both while it cures and for the future to hold the mold when it will be used to cast the new molds. After the mold has cured, it is carefully peeled off the ceiling. The original molding is not damaged and the new mold is a perfect reverse image. The new rubber mold is then inspected and is now ready to be used to cast new duplicate moldings. The above molds were used to create these castings, seen here lying on the floor, ready to be installed. The new castings are then installed to perfectly match. The first step was to pry up the old floor. 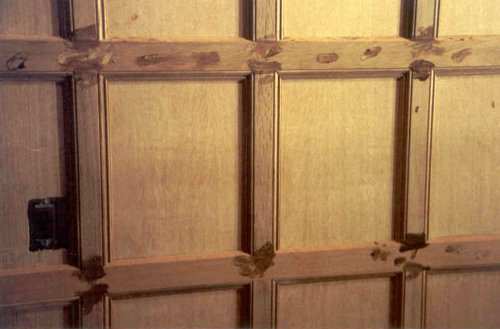 It was a beautiful floor of tiger ("quarter sawn") oak of long lengths. The original nails used are no longer made, being the foundry-cast spikes. We have saved some for you to look at. One of many piles of old floor, making a huge pile in total. Almost 4,000 square feet of old floor was removed. 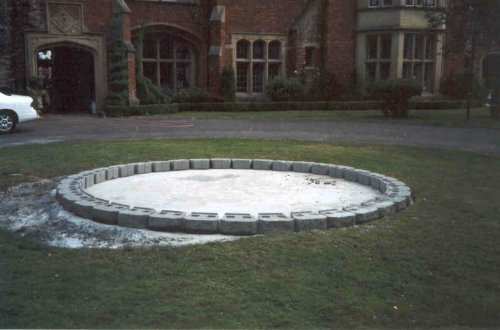 Some wooden "sleepers" or 2x3's were replaced, cemented in and leveled. These are what the old floor is nailed to. The sub floor is solid concrete in the Castle. These wood strips are then cemented in. The new floor was laid, occasionally needing to cut out old obstacles. The new floor was then sanded (rough and finish). The edges were sanded, where the larger machines could not reach. The floor was then hand-stained. Several coats of finish were added and allowed to dry. First, the existing trees and shrubs were removed from the center of the circular driveway. 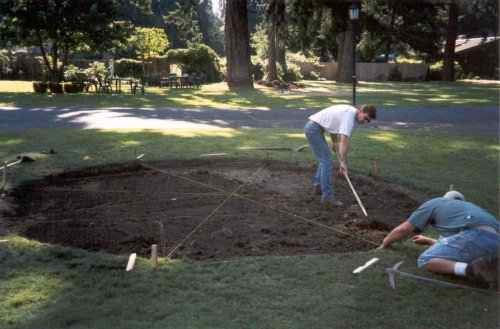 Then the hole is dug for the bottom and foundation of the fountain. Rebar is added and final adjustments made before the cement is poured. The cement is poured, then finished smooth. The first course of cement block is added. 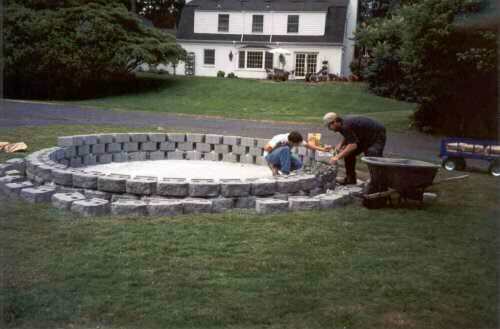 Three rows of concrete block were then added. After the block walls are laid with cement, wire mesh is wrapped around the wall. The block walls are then toweled with two layers of cement. Solid concrete pavers are cemented on top of the wall and a pattern toweled into the outside wall. Here is the finished fountain, in the morning mist.